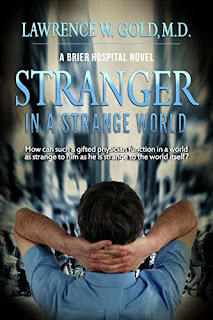 This novel will make you think twice before you label people with Asperger syndrome. They are usually highly intelligent--more so then the "normal" person. They do have problems with socialization--but they can learn to deal with that if they decide they want to. When Luke Hyatt was in a car accident he acquired a form of Asperger's. Prior to the accident he and his identical twin were residents at Briar Hospital. Will Luke be allowed to continue? The struggles that Luke encounters both professionally and personally will alternately make you want to laugh or cry. His encyclopedic mind will astound you! Another winning book by Lawrence Gold!! An automobile accident shatters the near-perfect lives of David and Luke Hyatt, identical twins. David survives intact, but Luke nearly dies from his injuries. The residue of Luke’s head injury is an acquired form of Asperger’s. The twins had graduated from medical school and were about to enter an internship at Brier Hospital in Berkeley. Although Luke is gifted with savant-like intelligence, can he continue his career in medicine? Will health professionals, administrators, and patients themselves accept Luke as a physician or succumb to the petty fear of someone different, or is it time for the world to consider the value of an individual beyond his or her label? We live in beautiful Grass Valley with 11 year old Bennie, a Yorkie who just looks like he’s on steroids and 2 year old Wesley, a long-legged terrier mix with the personality of a cat. This book sounds very interesting as does his next about malignant melanoma. I always wonder if maybe medicines and cures are held back for whatever reason. I hope to see Luke be able to do what he has planned and was educated for, unless, he now has some other passion but it doesn't sound like it. It sounds like he is in for grief from the red tape of it all.